The most abundant butterfly on Caribbean islands is likely the gulf fritillary. Its wings from above are rich orange with black spots, from below a dirty orange mottled with white spots that glimmer silver in sunlight. Medium-sized, these butterflies reproduce all year long on Caribbean islands and along the gulf coast. 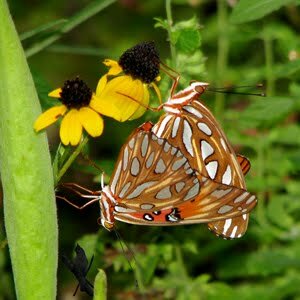 Each year they spread northward as spring warms into summer, each generation expanding their range, but the gulf fritillary can not survive a hard freeze in any form, egg, caterpillar, pupa or adult. When winter comes, the species range collapses back to its coastal core. Most years, gulf fritillaries make an appearance in East Tennessee, and they may hatch a generation or two before winter sets in. This year they did well. 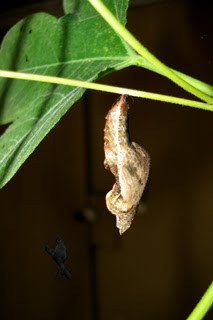 I witnessed at least three generations, including an adult that hatched in November in my kitchen from a chrysalis on a plant brought in from the porch a few days prior. I don't know whether it would have emerged had it remained outside. I don't know whether it headed south after I released it, whether a bird gobbled it up before it got anywhere or what, but the day after it hatched, in good flying weather I set it free. In early November, I saw a pair mating. The female surely had trouble finding a passionflower vine to lay eggs on, and her offspring likely starved or froze if they even hatched. They were this year's doomed generation of gulf fritillary. These November butterflies were the last of 2011, but they were not the first. The fritillary that emerged in my kitchen was born in late August, part of a hatching that reduced a prolific, porchrail passionflower to bare vines as September progressed. At the height of the feast, black-spined, red caterpillars in all stages of growth covered the plant. The biggest eaters hatched in late September. Most faced a dwindling supply of leaves and cold nights, pupating later in the year if at all. Though at best a quarter of the caterpillars survived to form a chrysalis, we still ended up with a good dozen pupa hanging under the eave above the porch. The first generation to reach Tennessee in 2011 arrived as July turned to August. They hatched a generation of fritillaries that fatted themselves on Tennessee leaves before laying eggs of their own. If the first generation's grandchildren had the good sense to fly south, their genes may have blended back into the core population in and around the Gulf of Mexico. Is the gulf fritillary evolving an overwintering strategy? Is their range expanding due to climate change? Was their success in Tennessee this year merely stochastic? Yes to all three. Any traits that favor range expansion are likely to perpetuate and rise toward dominance, and stochasticity is always present because it is entropy. A yearly excursion northward is an overwintering strategy, even if a clumsy one. The gulf fritillary is evolving right before our eyes.